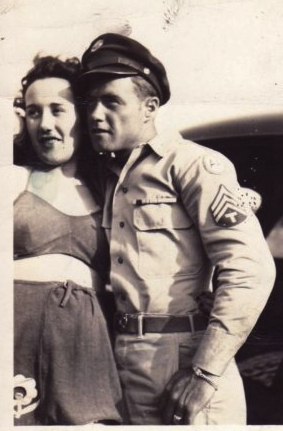 July 17, 2011 By Katie P.
My grandfather, Robert Lee Updegraff served in the United States Army during World War Two. He was a Platoon Sergeant in a Special Operations Group and spent the majority of his service in the American Theater of Operations, specifically the Panama Canal Zone. When he had owned his new car less than a year, Sgt. Robert Updegraff went into the armed forces and for two years mingled with snakes and skeeters and such in the Canal Zone. His big worry when he went into the army was what to do with his car. He wanted to have it when he got back, if he ever did. Letter Carrier William Butler heard about Bob’s predicament and told him to put it up in his garage. There is has been for two years, rent free. Now Bob is back in this country and an instructor at Camp Stewart, Ga. Leonard Quinlan got his car fixed up for him and it is used for military purposes at camp. I wonder what kind of car it was. As a young man, I imagine he worked hard and saved to purchase it. Also, the random acts of kindness from Letter Carrier William Butler and Leonard Quinlan are heartwarming. I wonder who they were and what their relationship to my grandfather was. 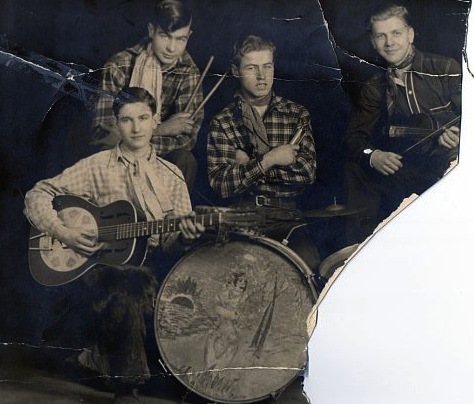 When Lee Updegraff wrote from the Panama jungle that he wondered if I could get some musical instruments, sheet music and such for the boys, he didn’t figure on getting very much. He would have been satisfied with a mouth organ here or there. But that isn’t the way Youngstowners do a job. I ran the line here and the music teachers and some others got to work. Now, out in a jungle military camp in the Canal Zone, too far removed for movies and similar entertainment, soldiers from all over the United States get together in the evenings and play their band. They have mouth organs, string instruments and some horns sent from Youngstown. Updegraff says the din is terrible and all the panthers thereabouts have left for South America. They couldn’t stand it.